Located at 1032 West Seventh Street in Saint Paul, Minnesota, the Historic Pilney Building is one of the most recognizeable landmarks in the West End, with its Flatironesque architecture and vertical "PILNEY" neon sign. It was built in 1913, and was the home of Pilney's grocery market and butcher shop until the late 1990s. 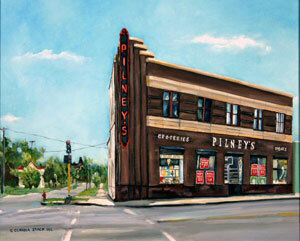 Pilney's Grocery Image ©1992 Claudia Stack. All Rights Reserved. Used With Permission.